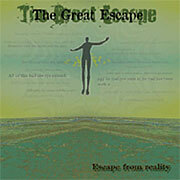 The Great Escape - "Escape From Reality"
The Great Escape is a new German Psychedelic rock band that really likes to jam and spread things out. This double vinyl release was recorded in late 2003 (except one track) and has long grooving tracks like Colour Haze. The first side (Escape Side) opens with King Of The Race. It has a heavy Sabbath like riff and in the mid section with a long guitar interlude. The title track is next and begins as a slow spaced groove until the final minutes when it takes off into heavy psychedelic rock only to return to the space groove. Side 2 (Reality Side) begins with Sweet Smelling Summer, a slow grooving biker tune with some stoned laid back vocals. WhereEver You Are speeds things up and is a great rocking number with power vocals, like Jesper from Gas Giant and a great wah solo. Cosmic Rider ends the side and uses some samples from NASA about a spaceflight take off. This song is based on a heavy bass line and spaced delay guitars and vocals and then back into the heavy riffing before the jam. Cool. The third side (Ride Side) starts with Strange Pictures (recorded in 2002) and is very different from all the rest of the songs. It has a very laid back groove and a long guitar solo and some cool phased parts. Ride On is another slow, slightly funky spaced out song that takes off and comes back down gently. If Time closes side 3 and has a real 70s style sound and features some cool psychedelic guitar playing. The fourth side has two long jam songs. Experience is a Colour Haze like groove rocker with a spaced out mid section. Goodbye closes the record and starts as a slow floating psych rock song with some really colourful guitars. A beautiful song. Take a more jamming stoned version of Spiritual Beggars mixed in with the grooves and long songs of Colour Haze and you can get an idea of what this is like. Great stuff, but be patient and listen and you will be rewarded! For more information you can visit The Great Escape web site at: http://www.thegreatescape.de.